195cm long, 60cm wide, 100cm high. Weight:- Hog roast 163 kilos. Spit roast 174 kilos. Combi 192 kilos. 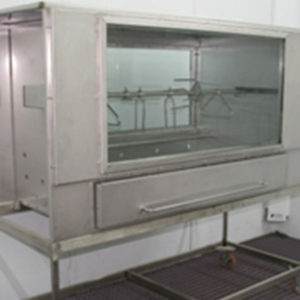 Stainless steel doors, three glass viewing panels. Four large heavy duty castor wheels and two with steering mechanism. The connoisseurs hog roast machine. 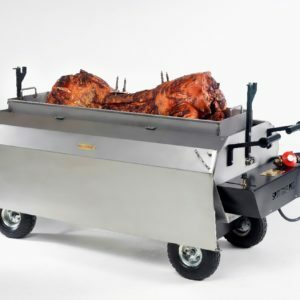 This amazing machine can do lots of different things all at the same time and is a truly multi-functional versatile hog roast machine. 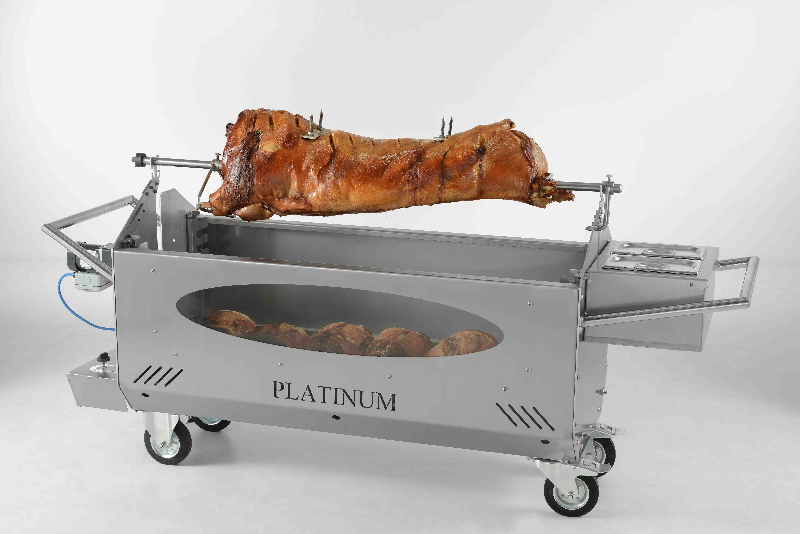 By utilising its two cooking levels it can cook two pigs and four boned and rolled legs of pork at the same time. Or lots of different types of food at the same time. You can also use the machine as a bbq whilst cooking a pig. Or cook a pig and a full selection of vegetables and breads at the same time it really does have endless opportunities. 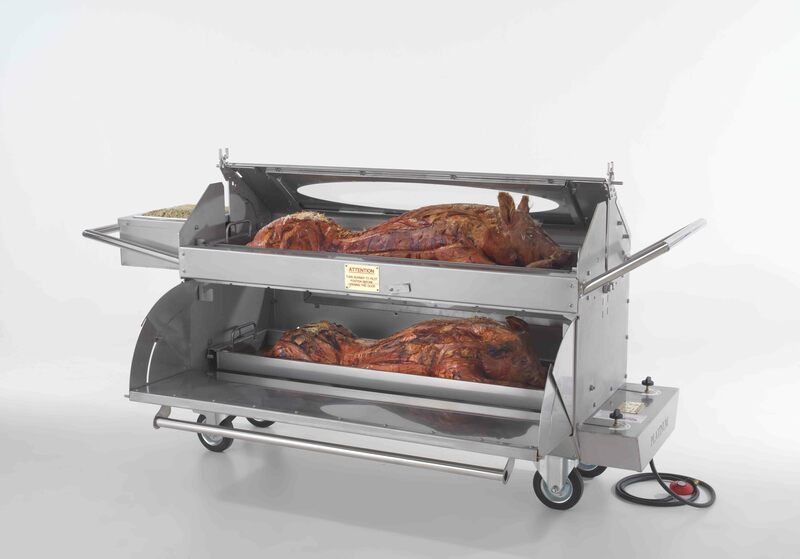 This is the most versatile hog roaster on the market, it can spit roast a pig and cook 8 legs of pork, or jacket potatoes and vegetables all at the same time. Or it can hog roast two pigs and 4 legs of pork at the same time, or again hog roast a pig and legs of pork jacket potatoes etc. You can also hog roast a pig and use the machine as a bbq at the same time. The extra food being cooked can be accessed via the lower door and does not affect the cooking of the pig. It will last for years with very little maintenance and will still look as good in years to come. This machine is built to work hard and last. The machine is very easy to manoeuvre with its 4 wheels. 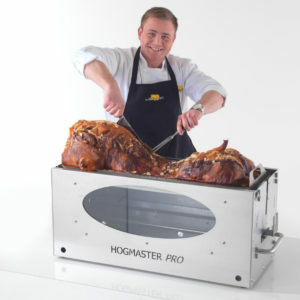 Will cook up to a 75 kilo pig head off, or 60 kilo head on and 8 legs of pork, or jacket potatoes etc all at the same time. Cooking time 1 hour for every 10 kilos of pig. Will cook a 75 kilo pig head on, or 85 kilo pig head off, and ten boned and rolled legs and 150 jacket potatoes, or two 65 kilo pigs and 4 legs and 15o jacket potatoes all at the same time (needs two hog roast trays). 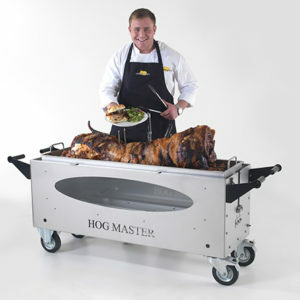 This machine has enabled me to cook two hog’s at once, which is great for business!